Ditter is a company you’ve probably never heard of located in Shenzhen China, the ultimate home of most electronics. If you google the brand however, you’ll find a lot of forum chatter surrounding their affordable line of XBMC-compatible media players available for sale from a number of sources. We received the U20 model—which uses an Allwinner A20 dual core 1.2GHz CPU and have been putting it through the paces. 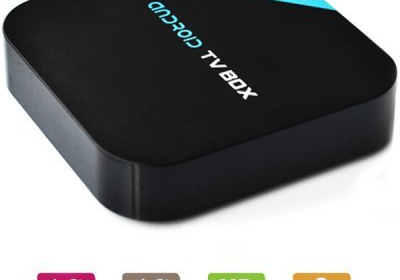 Available for just under $50, this tiny box is similar in footprint to an AppleTV, and touts a world of features at a fraction of the cost. In this review, we will dig deeper to see if all the hype lives up to the performance. As mentioned in the introduction, the Ditter U20 has an impressive list of features, including a wealth of supported video formats and up to 1080p video resolution. It also includes both integrated Wi-Fi and RJ45 connections. As you can see from the above dimensions, the Ditter U20 weighs 153g and is just 3.8” wide by 3.8” long, and just 0.90 inches thick. The unit is a sleek black and could be integrated quietly into any home theater or bedroom. The front of the unit has a small blue LED on it, which might be too bright in an unlit room. There’s no simple way to disable this, besides using electrical tape to hide it. On the left side of the unit are two USB ports which can be used both for external storage or for input devices. Given that the OS included is a mobile friendly version of Android, we leveraged the port with a wireless USB keyboard which made setting up the unit (and typing Wi-Fi passwords) significantly easier. Our unit arrived with an international (two prong) wall plug—a mistake we were told was made by the distributor, but that the company does offer US (DC) versions. In addition to the outlet, the Ditter U20 also includes a mini-to-AV set of cables, an HDMI cable, a remote control and instructions sheet. Given the retail cost of the unit, seeing it with an HDMI cable was a nice surprise. The Ditter U20 comes out of the box with a rather vanilla version of Android OS version 4.2.2, with a kernel of 3.4.39. The build number is shown in the screenshots for those curious, and the model number is “Allwinner_UPD_A20.” The system includes 1GB of total space available to download applications, but you won’t be loading much content on the local hard drive. By default, the U20’s version of Android includes the following: Browser, File Manager, FireAir Receiver, Miracast Receiver, Music, UHD Player and YouTube. As we believe the majority of users would be using the U20 as an XBMC client, we predominantly used that as our media player, using the latest version of XBMC for Android (now called Kodi)—which as of this writing, was 13.2. Although there are many branches of XBMC which have been created and optimized for usage on a variety of devices, we thought it fair to judge the unit based on its merits against the official release. The system itself is quite responsive, even with the graphically intense background and overlays of XBMC. At startup, the interface is smooth and fast, but we found as we tested it that this began to lag as we started and stopped a variety of content from it. For file testing, we used a variety of bitrate and file types to see how well the unit held up. The unit is advertised with “1080p” claims, which would be impressive given the low cost of the box. Unfortunately, tests proved this to be a bit impossible. Only with some extremely low bitrate 1080p files was the unit able to play. I tested VOB, MKV, DIVX, AVI, MPEG4, and a variety of other file types at varying bitrates to see what the Ditter could handle. When it came to 1080p, the U20 choked and stuttered while playing pretty much everything. We found better success with 720p, with the exception of very high bitrate encodings in H.264 with HD surround sound formats such as TrueHD. Every video file I had at my disposal at 480p or less the unit had no problems playing, and the file type compatibility was broad as well—I was unable to find a video type it was unable to play. It should be noted that there are some custom versions of XBMC which have been tweaked and modified to improve performance on these types of lower powered media clients, but in our opinion a box being advertised as such should be able to meet the specifications listed. There are a number of Ditter units available for sale, at slightly higher cost than the U20, and we can’t help but wonder how much better those units would be able to handle higher quality media files. The Ditter U20 unit is a tiny, attractive, quiet solution ideal for any environment, and the USB ports allow for storage expansion if you desire. The features listed are great, and the Android platform allows for a variety of functionality. It’s simply too underpowered for a dedicated home theater, but if your video needs are less the Ditter is a more than capable XBMC client. Thanks to Gearbest for providing the Ditter unit for review. Gearbest is offering a 5% coupon code for Missing Remote readers, use code “Sophia05”.